Are you in the midst of planning a fun event such as a backyard BBQ or tent setup? If you have a large event coming up this year, one of the main aspects to consider is picking the right caterer in Edgewater, MD. Whether it’s an anniversary party for your parents or your corporate summer picnic, you want to know you can rely on the caterer you choose. Here are a few tips for picking out the right caterer for your upcoming event. Can They Handle Your Event? When you are talking with your potential caterer in Edgewater, MD, you should know if they have experience in your type of event. This is especially true when it is a large event or corporate backyard BBQ. Discuss their experience with these types of events and find out if they have successfully catered them before. Not every caterer is a one-size-fits-all type of choice. You should have confidence that they understand the event you’re hosting. When contacting your Edgewater caterer, have they been responsive to your request? Be realistic and understand they may not always answer right away. However, consider how long it has taken them to return a phone call or email. If you start out having issues contacting them, it may be a good idea to take your business elsewhere. While most caterers have specific catering menus, some will offer customized menus. Is your catering company flexible in the planning of your event? Do they seem to respond to your needs and work to adjust their menus to your event’s requirements? Your caterer should be able to work with you to create a menu that fits your specifications. Do They Know the Venue? 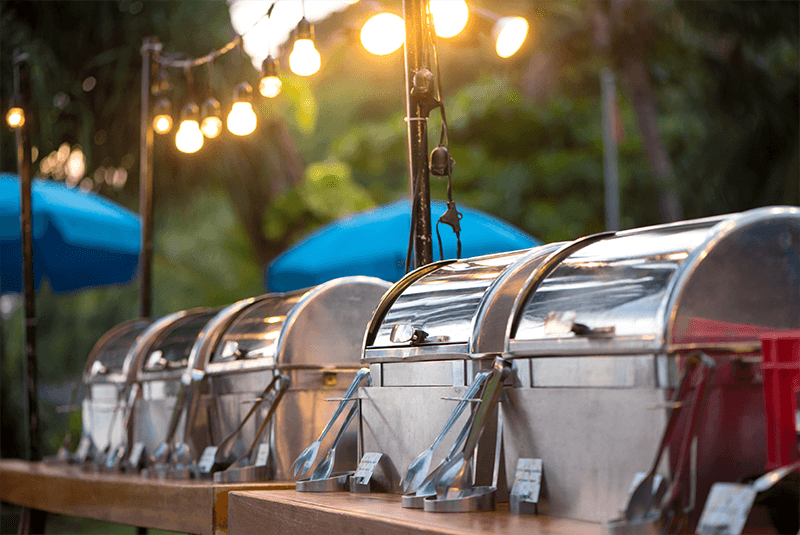 If you are planning a large backyard BBQ or a more intimate wedding, you want to make sure your caterer is familiar with the venue. Specifically, you want to have confidence that your caterer knows the ins and outs of the location. They should understand the venue itself and the requirements for outside caterers. Be sure to talk with your caterer about locations and where you wish to host the event. In most cases, you are going to be spending a good amount of money on catering for your event. So, you want to know that the food they are providing is palatable and enjoyable for the guests. One way to do that is by having a catering tasting. That is if your caterer provides those services. That way you can taste the food beforehand to see if it is a good match for your event. There’s no better way to ensure that you have chosen the right caterer than by talking to prior customers. Your potential caterer should provide at least three references you can speak directly to. This allows you the opportunity to gather information, ask any questions you might have, and see how the catering was handled. Another aspect to consider is the caterer’s cancellation plan. It should be simple and easy to read and understand. You want to have it in writing before signing up for any event catering. This protects you and the caterer in the case of cancellation. While browsing your catering options this season, consider some of these important aspects before making your final decision. You can have a fantastic event by choosing the right caterer in Edgewater, MD. If you should choose Adam’s Grille, we handle events large and small, and in some instances, we offer customized menus. Our high standards of food and service, along with our careful thought and planning, ensure that all the details will be taken care of. Further, we provide serving tables and coverings, all serving pieces, and high-quality disposable plates, forks, knives, napkins, and wetnaps. We can also arrange for tents, tables and chairs, linens, and other supplies or services for your event. Additionally, special presentations and additional services are available for an additional charge. Check out our extensive catering menu today! Further, we have worked with many wedding venues in Maryland. If you are thinking about having a rustic wedding in Maryland, contact us to learn more about our catering services and previously catered venues. I do agree that it’s important to make sure that the catering company that you will choose can provide palatable and enjoyable food for the guests since you will spend a good amount of money for the catering of your event. My fiance and I are looking for a catering company for our wedding 3 months from now. It’s important for us to ensure that our guests will enjoy the food that will be served on our wedding day to make sure that they will remember our wedding party as a memorable one. It will make sense for me to find catering companies that offer food tasting so we can make an informed decision on what company to hire. Thanks! It really helps to make sure you get references like the article suggests. After all, when hiring a caterer you want to make sure that they’ve worked big events before. Their references will tell you how much experience they have with events like yours. I appreciate your suggestion to find a caterer who offers tastings. My company is wanting to do a big company event. I’ll have to make sure they choose a caterer with tastings so they can test out the food beforehand. Thanks for the advice for choosing a catering company. We want to hire the best one for our wedding, so this is fitting. I’ll be sure to find someone who is good at communicating, like you said. You make a good point when you say that a caterer should know the venue. It would be good to consider their experience in the venue so that they know they will feel comfortable. I’m trying to help my sister find a caterer for her wedding venue, so I’ll have to consider the venue first.